Also serving communities of Friedens, Meyersdale. There are 3 Assisted Living Facilities in the Somerset area, with 2 in Somerset and 1 nearby. To help you with your search, browse the 1 review below for assisted living facilities in Somerset. On average, consumers rate assisted living in Somerset 2.0 out of 5 stars. Better rated regions include Normalville with an average rating of 5.0 out of 5 stars. Caring.com has helped thousands of families find high-quality senior care. To speak with one of our Family Advisors about assisted living options and costs in Somerset, call (855) 863-8283. Somerset is located in the Laurel Highlands of Pennsylvania, which is a scenic destination for all types of outdoor recreation. Somerset County is also known as the site of the Flight 93 Memorial in Shanksville. The borough has a small population nearing 6,000 people, with about 20 percent of residents at retirement age of 65 and older. Seniors in the area will find two assisted living facilities within the borough and another five in nearby communities, including Jerome and Ligonier. These facilities are regulated by the Pennsylvania Department of Health and may be classified as personal care homes or assisted living residences, depending on the amount of care they offer. Somerset is a nice location for seniors who enjoy marked seasonal variation. Summers are moderately warm, with an average July high of 79 degrees Fahrenheit, while winters bring a whopping 98 inches of snow and an average January low of 15 degrees. The air quality in Somerset is 11 percent better than the U.S. average on a 100-point scale, which may make the area more comfortable for seniors with certain respiratory conditions. Public transit is provided by the Somerset County Public Transportation System, which is a door-to-door service that requires advanced reservations. The bus operates on weekdays only, but senior citizens pay a reduced fare. Seniors may feel more confident knowing that Somerset is one of the safer communities in Pennsylvania. The violent crime rate is much lower than the state and national averages, although the rate of property crime is slightly higher. The Somerset area includes many places for seniors to experience the arts and culture, such as the Laurel Arts multidisciplinary center, the Somerset Historical Center and fall festivals. Somerset has an array of community resources for seniors, including the Somerset Senior Community Center, which offers educational classes, guest speakers, bingo and other games, volunteer opportunities and hot lunches. Assisted Living costs in Somerset start around $0 per month on average, while the nationwide average cost of assisted living is $4,000 per month, according to the latest figures from Genworth’s Cost of Care Survey. It’s important to note that assisted living rates in Somerset and the surrounding suburbs can vary widely based on factors such as location, the level of care needed, apartment size and the types of amenities offered at each community. 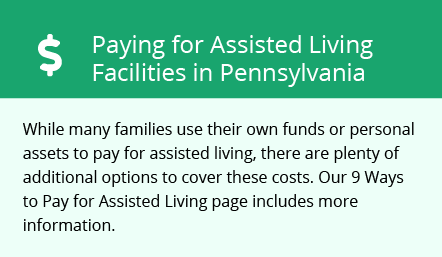 Seniors in Pennsylvania can receive financial coverage for assisted living through Medicaid waivers, such as the Aging Waiver or the Independence Waiver, depending on financial and medical eligibility. Seniors with both Medicaid and Medicare may receive coverage through the Community HealthChoices managed care program. Somerset and the surrounding area are home to numerous government agencies and non-profit organizations offering help for seniors searching for or currently residing in an assisted living community. These organizations can also provide assistance in a number of other eldercare services such as geriatric care management, elder law advice, estate planning, finding home care and health and wellness programs. To see a list of free assisted living resources in Somerset, please visit our Assisted Living in Pennsylvania page. Somerset-area assisted living communities must adhere to the comprehensive set of state laws and regulations that all assisted living communities in Pennsylvania are required to follow. Visit our Assisted Living in Pennsylvania page for more information about these laws.